We believe that the best way to learn about how water behaves in rivers and at the coast is by seeing it in front of you. 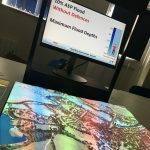 That’s why we’ve created a suite of physical models to demonstrate the key principles of flood and coastal risk management. 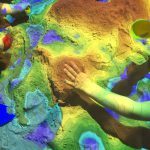 An interactive visualisation tool that shows how topography affects water moving through a catchment. 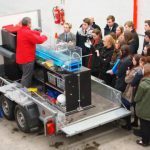 A portable wave tank that demonstrates the performance of coastal defences under different wave conditions. 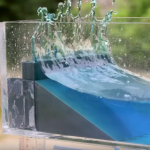 A large hydraulic flume showing the flow of water in a simple channel and featuring scale models of typical engineered structures including weirs, bridges, culverts, screens, fish pass and a hydrobrake. 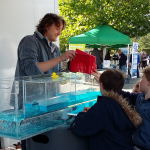 Our first mobile demonstration model showing the flow of water in a simple channel and how typical engineered structures interact with the flow and affect flood risk. 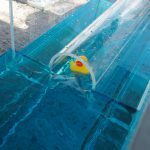 The ‘mini’ flume demonstrates the interaction of engineered structures with flow in a channel but is more portable than the trailer flume and can be set up inside, for example in a classroom or office. The Projection Augmented Relief Model (PARM) is a 3D printed scale model, based on LIDAR data, with a projector that overlays information on to the model. We are always looking for opportunities to share these training resources. If you think the models could be useful for your work with students, professional groups or communities then please contact us to discuss how we could share our models or come to you to deliver a demonstration. Alternatively, if you would like to use these physical models to support training that you deliver, they are available to hire.